…”But there are spiritual lessons to be learned—examples in the garden that cannot be learned so vividly anywhere else. One sighs as one gradually realizes that there is simplicity here, and great and complicated depth all at the same time. I love this time of morning. If you can see the little white dot...that's the moon. It's really fun to pick green beans that are hanging over your head! Harvest time has been keeping me pretty busy. Loads of tomatoes have been ripening, as well as a few pumpkins, more beans and cucumbers. Today I picked a good amount of blackberries, and will can my family's favorite blackberry syrup tomorrow. Timmy and Joe rode lots of rides. And so did my sisters and Kyle! I think they really enjoyed that. Joe did Mutton-Bustin' this year; he held on to that sheep until the very end! It is always entertaining to watch the draft horse shows! It was great fun watching the Konzelmans. They are a very talented family. I love all the lights at nighttime! I got to ride the sky-ride with Victoria. We really enjoyed that! Last night we had Timmy's official birthday celebration at Meemom and Papa Bob's house. Didn't Victoria do an excellent job on the cake?! A couple of happy guys! This was a really neat find. In all my soap making research, I stumbled upon quite a few articles about making your own laundry soap. What a great money-saver, I thought. Dissolve the soap scraps in a pot with 5 C. of water. 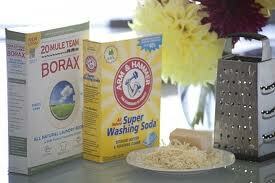 Turn off the heat, add borax and washing soda. Mix well and pour into a 2 gallon bucket. Fill bucket with warm water up to within 3 inches of the top. The mixture will thicken as it cools. This makes about 40 C. detergent. You can buy boxes of washing soda and borax for about 5.00 each, and the Fels Naptha soap is under a dollar a bar! If you make your own soap, like I do, you can use that instead. I didn’t use any of mine this time, because the store-bought stuff is a little cheaper. One thing is for sure though; mine smells a lot better than the Fels Naptha. These are mostly older pictures of our family. But thanks to a dear friend who lent me her strainer, the process went quite a bit faster! I don't know what I would have done without it. I didn't know I grew a yellow tomato plant! Now I know what blossom end rot is. A couple plants of a certain variety are not resistant apparently. All of my Roma tomatoes are just fine. I got nothing I asked for—but everything I had hoped for. Extremely, impossibly, unbelievably, adorably cute. That's our farmer Joe. He doesn't just wear the words, he lives by them. He and Timmy have been enjoying the big dirt hill in the front area of our yard. They come in caked sometimes! My sister Valerie has been working long and hard on a very special video about a very special little guy…our new brother Benjamin Justice Bowes. I am excited to post and share this incredible video that she put together for him. When he gets a little older, we can’t wait to show him all of the people that loved on him and prayed for him and for the entire adoption process. THANK YOU everyone for all of your prayers! The Kunkles (who are some dear friends from church) joined us in the courtroom on that happy day. Mr. Kunkle took many videos and pictures for us! Here we are afterwards, standing beside the court building. It's fun watching people and looking at all the huge buildings! I admit it, Seattle is a really neat place. Wouldn't ever want to live there, but it is fascinating to see and visit every now and then. We went down to the waterfront to feed the seagulls and eat at Ivar's. Benjamin started to get tired....I don't blame him, because we woke him up and left our house at 4am! Isn't this an awesome picture?!!! Benjamin was happy that Richie came to join the fun!